... Other people's vomit, that is. A couple of weeks ago, our household was hit by the horrible tummy bug that's been going around which includes an horrendous few days of vomiting (and / or the other end), followed by a good case of the sniffles. Not at all fun. While hubby and I managed to avoid the worst of it, and Hannah seemed OK once she completely covered me in a massive amount of vomit on only one occasion, poor Bethany really got hit hard. She was down and out ... like didn't leave the couch for a good 3 days, and was still not herself for about a week all up. She also managed to cover me at least once in copious amounts of vomit, as well as dripping it through the house one night when she came in to tell me she'd been sick ... poor poppet, but seriously... gross!! I just love this gorgeous skirt from Craftiness is Not Optional, which is one of my absolute favourite blogs ... I just love every single thing this chick makes. 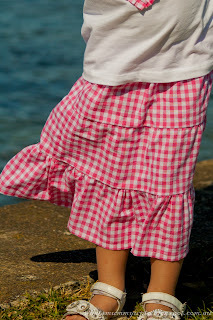 The thing that really caught my eye with these skirts was, of course, the pink gingham. 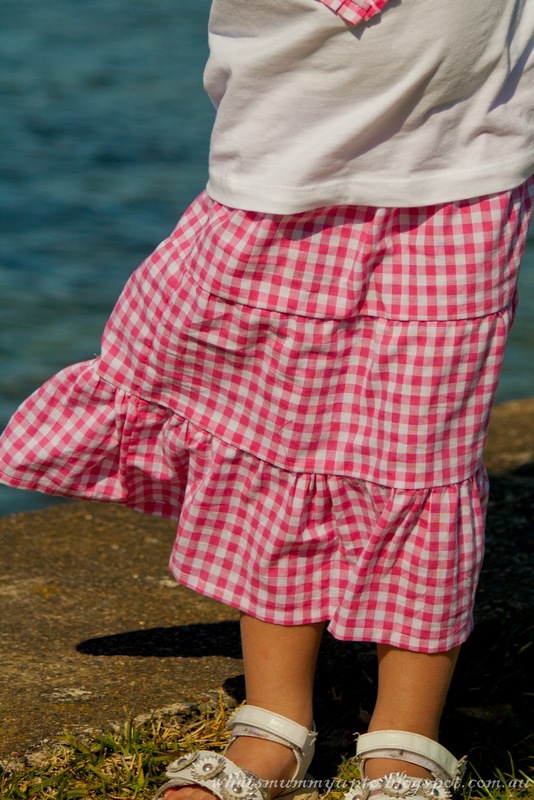 Pink Gingham (well actually any colour gingham) is just something I can never walk past. I love it. I also love, and am totally addicted to Ric-Rac ... you know that zig-zaggy type ribbon... anyway, that's another story, and completely unrelated to this!! So, the other thing I liked about this little tiered skirt, was that it involves some gathering, which I've never attempted before, and thought this would be a cute, gingham-y way to learn a new technique. Turns out it's super-simple, and really looks great ... so happy with Bethany's new skirt. 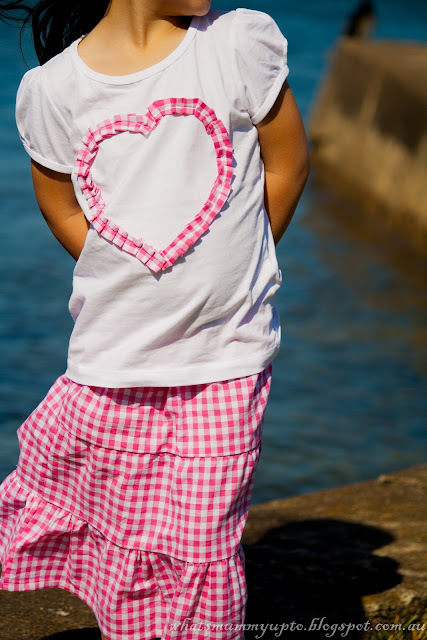 But of course, every skirt needs a matching T-shirt, and I wanted a little change from plain applique, which I've done lots of lately, so I thought I'd try the Ruffly Heart T-shirt, also from Craftiness is Not Optional. This was sooooo much easier than it looks, and really effective I think. Bethany loves this little shirt. Oh, and I bought a whole bunch of plain T-shirts from K-Mart for $3 each ... yep, really $3. 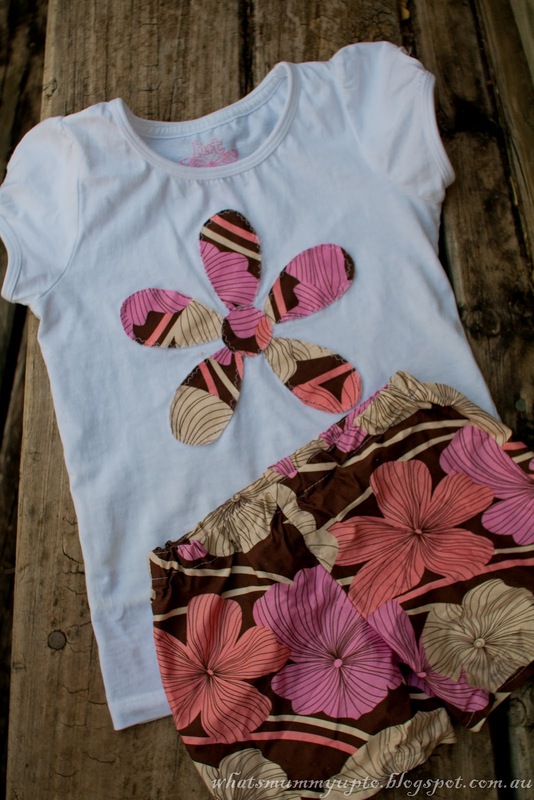 What a cheap way to create one-of-a-kind T-shirts for summer, hey!! Now that I have mastered gathering (well, kinda) I decided I was ready to try another little skirt that I have been really wanting to make, but was a little frightened of the new techniques involved....the Market Skirt with Gathered Pockets from Dana Made It. Initally I had a pink and red striped fabric in mind for this skirt, but as I was going through my fabric box (yes I had to get a plastic box with a lid to store all my recent fabric purchases in ... I tell you, I'm addicted. I'm pretty sure it's a sickness of some kind), I found this gorgeous bright fabric with the little heart candies with "love", "kiss me", "sweet"etc on them. Remember those?? Anyway, I think it looks gorgeous and I'm so happy with those little pockets. 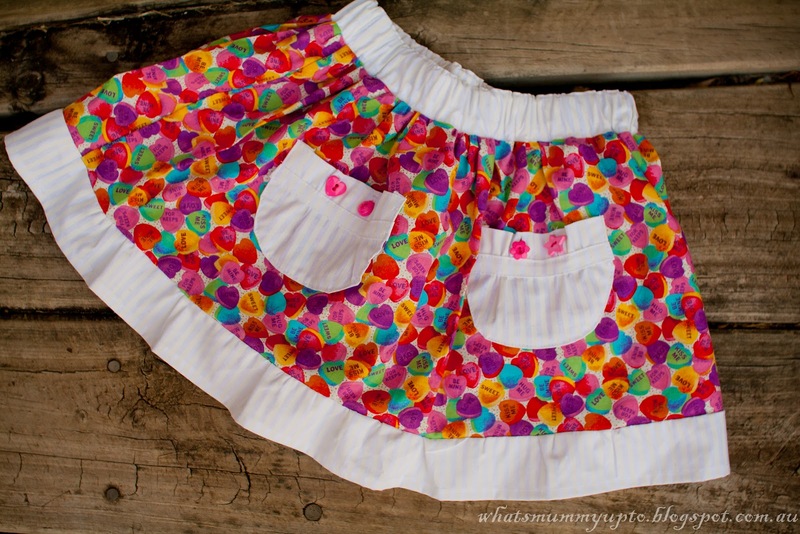 There was some serious stressing going on when contemplating those, but I think I pulled them off, and Bethany just loves how "spindy" this little skirt is. Love this photo. Hands on hips and tilted hip in real model style. 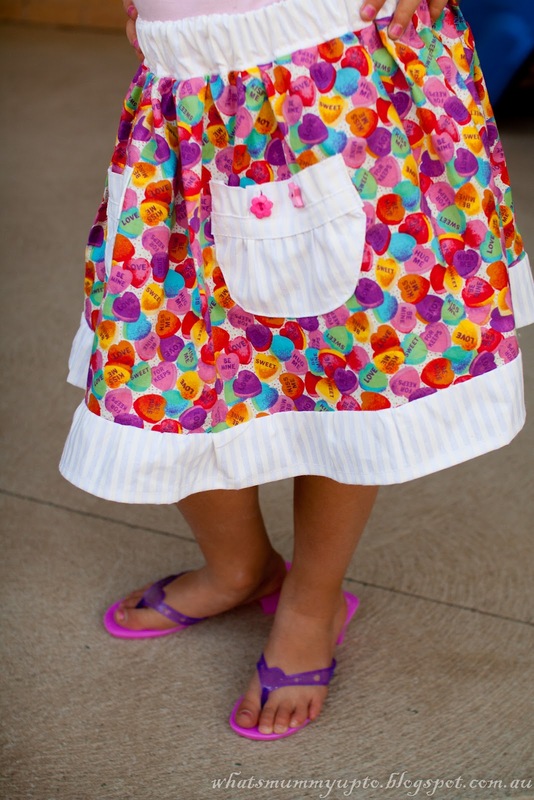 When asked if she'd model her skirt for Daddy (aka Mummy's photographer), she decided she'd wear her "high-heels"! Another thing I've really wanted to try is making shorts. But as I've mentioned before, patterns scare me to death, so although my Mum has a zillion patterns that she keeps offering to me, I felt much more comfortable about following the easy, photo-guided steps of an online tutorial to make my own pattern. I used this one from Scattered Thoughts of a Crafty Mom. I didn't go the patchwork option, cause I really couldn't be bothered at the time, and I wanted to use this cute Hibiscus fabric left over from a project many years ago. But I did do the matching T-shirt, and Bethany told me just the other day that she was so excited to wear this T-shirt, because it's her favourite ... awww! So that's my projects from the week of horrors at our house. Funny that these days making things that aren't even for me is just so relaxing, and makes me feel like Wen, even in the midst of all of life's business and drama. Love it. Thanks Jamie, and Bethany still loves that T-shirt ... I love your designs! We're heading into winter now, so I'm in the middle of a mad rush of sewing up cute little winter outfits for the girls ... they soooo don't need any more clothes, but I just can't seem to stop!!! !